blatter's racism remarks are just the latest in a long line of major gaffes by the fifa president. I would deny [that there is racism on the pitch]. There is no racism, there is maybe one of the players towards another, he has a word or a gesture which is not the correct one. But also the one who is affected by that, he should say that this is a game. We are in a game, and at the end of the game, we shake hands, and this can happen, because we have worked so hard against racism and discrimination. And on the field of play sometimes you say something that is not very correct, but then at the end of the game, the game is over and you have the next game where you can behave better. Judging by those statements, you obviously haven’t been paying attention to the game you claim to govern and protect. only potty mouths would cover their blab hole during matches. If you had, you would have noticed that your sport’s most popular league currently has two ongoing investigations into on-field incidents of racism involving several very high profile players. If neither of those incidents ring a bell, perhaps you’ll recall an incident during last season’s much hyped series of Clásicos where Barcelona’s Sergio Busquets called Real Madrid’s Marcelo a monkey. And in case you hadn’t noticed, all of these incidents occurred on the pitch, which is pretty contradictory to your statements above. Still not convinced that racism still exists on your hallowed professional pitches? 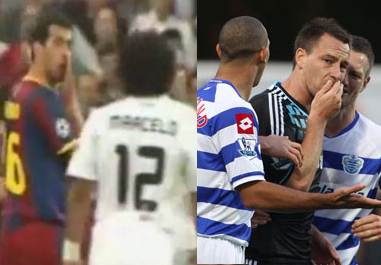 In both Busquets’ and Terry’s alleged abuses, the accused both covered their mouths while speaking. I don’t know about you, but I only cover my mouth when I don’t want anyone to see what I’m saying. With these star players keenly aware that a million cameras are pointing at them, why else would they cover up what they were saying? To be honest, we all should have expected this from you. After all, you are the same guy that suggested that women’s soccer’s would be more popular if the ladies would sport some shorts that hugged their rear-ends a bit tighter. You’re also the same guy that said John Terry’s adulterous life choices would have been celebrated if only he were in Latin America instead of Europe. And considering you didn’t think FIFA had a crisis on it’s hands when it was exposed that Executive Committee members were accepting bribes in exchange for their World Cup bid votes, we really shouldn’t have expected you to think racism was an issue anymore either. Take a look around you, Sepp: your house is clearly out of order. Corruption runs rampant at nearly every level of your organization. FIFA effectively raped and pillaged South Korea and South Africa during the last two World Cups, leaving each country saddled with massive debt for unusable stadiums as you mandated tax loopholes that enabled you and your cronies to pocket more of the profits. The next tournament looks to be more of the same, assuming Brazil are even capable of pulling off all of the required preparations in time to host the damn thing. With all of that in mind, it’s time to leave the game, Mr. Blatter. You’re stranglehold on world football has been too long, and it’s time to allow someone else to come in and clean up your mess. The sport needs a new direction, and you’re clearly not capable of providing the necessary leadership. Disgracefully, gracefully, I don’t really care how you go. Just go. Hell, I’d be fine for you just to retire away to your native Swiss hills or the Caymans or somewhere else where you and your dirty money can be shielded by friendly bank privacy laws… we’ll just be glad to be rid of you. If you have any respect for the game you’ve been “serving” for so long, you know deep down that your resignation is — like FIFA’s slogan — “for the good of the game”.